Oh to be a castle blogger! O wäre das nicht schön einen Burgenblogger zu sein! I often tell visitors to the Middle Rhine Valley (or to people whom I hope will come visit me here), "You will love this place, but only if you love castles, cathedrals, towers...and wine." The castle rulers: The kings, queens, princes, knights and bishops have long since gone, but the mammoth symbols of force and might which they built remain...filled with compelling stories, and possibly a ghost. Die Burgfuersten: Koenige, Prinzen und Ritter sind schon lange weg, aber die eindrucksvollen Symbole der Macht die sie erbaut haben, stehen noch...randvoll mit Geschichten, vielleicht auch mal ein Gespenst. The castles here, in this narrow river gorge, hang confidently onto cliffs like rock climbers, one almost every kilometer. 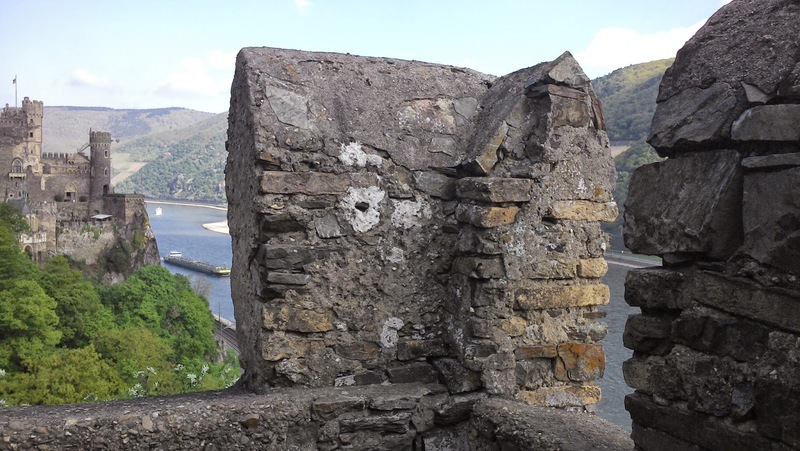 Or like the Kaub Castle, it sits delicately and obstructively smack dab in the middle of the river - no doubt, the perfect location for a small but serious toll collector, as was its original purpose. The castles have checkered pasts, like many of us, some as complicated a political thriller as a John le Carre novel. The townsfolk: Half-timbered houses amid cathedral spiers and castle turrets, the towns in the middle Rhine valley were built with blood, sweat, and wine (or maybe the Brothers' Grimm themselves, that's how much these could be the settings for fairytales). Die Buerger: Die reich verzierten Fachwerkhaeuser ergeben mit den von allen punkten sichtbaren Kirchturmspitzen und Festungstuerme ein ganz besonderes, einmaliges Stadtbild. Die mit Schweis und Blut und Wein gebauten Staedtchen im Mittelrheintal koennten von den Gebrueder Grimm selbst entworfen worden sein. A 16-year-old boy named Werner, was mysteriously killed, and such was the outcry for justice that both in Bacharach and Oberwesel - two impossibly gorgeous towns - impressive cathedrals were built in his honour. Apparently back in the 13th century they really knew how to honour their dead. Of course there are more disturbing details to this story, but the cathedrals erected as a reminder leave one feeling breathless in their ornate detail and awe-inspiring architecture. There are many intriguing stories of conflict, torment and perseverance throughout the Rhine valley, colouring each town like dots on a Dalmatian - too many to count, some darker than others. The tower dwellers: Built to keep watch and to protect, these stone guardsmen hold more juicy stories within their spiral staircases than can be found outside of them. An English queen kept her lover in one such tower, and a greedy bishop was eaten by revengeful mice in another...to give you a taste of the stories ripe for the picking here, true or not. Die Turmbewohner: Die weithinsichtbaren steinernen Zeugen, Turme zum Schutz und der Verteidigung bergen hinter den Kulissen pikante Geschichten. In einem Turm wird der Liebhaber einer Koenigin einquartiert, in einem anderen Turm wird ein Erzbischof von Mausen gefressen - vielleicht sind das alles nur Marchen, vielleicht auch nicht. The Mouse Tower, with its odd name and even odder story, stands like a colourful Disney-like watchman, at the mouth of this pinched section of the Rhine. But, if you like towers, then Oberwesel is where you need to go. The town wall, including its many towers, was built in 1220 to protect the Oberweselians and their increasing riches; and to keep the rif-raf out. Now the town is one of the most-welcoming, with medieval festivals and the most authentic night watchman tour I've ever experienced. A must on your 'to do' list. 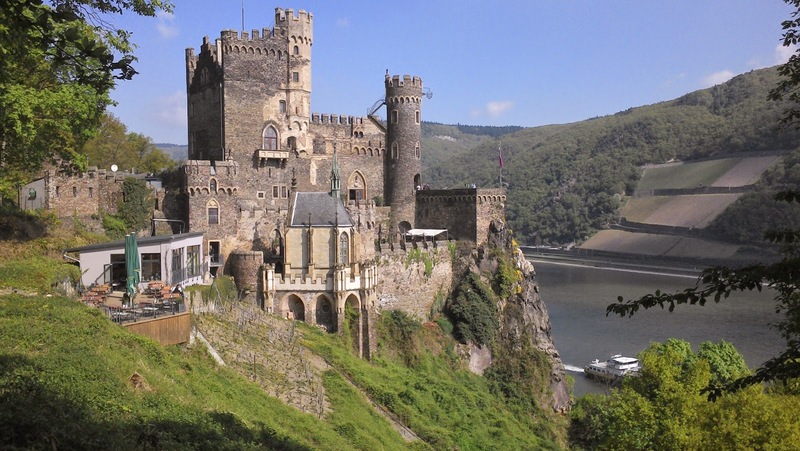 The legendary figures: Enchanting ghosts, bewitching temptresses, inspiring visionaries, and the evilest of villains fill the Rhine Valley with magic, wisdom, folklore and mythical romance. A warning: Don't believe everything you hear. Die Sagengestalten: Bezaubernde Verfuehrerinnen, inspirierende Visionaere und die boesten Boesewichten sind sicher auch noch Heute im Mittelrheintal zu Hause. Magie, Romantik, Wissenschaft, Schlachten - alles laesst sich hier entdecken. Warnung: Nicht alles muss mann glauben. There is a young woman who sits perched on a rock, below the steep cliffs baring her name: Loreley. She needs no walls around her, no shelter, but spends her time combing through her long strands of hair. Legend has it that this distraction has been leading sailors to nautical disaster for centuries. From the tops of these cliffs, the view of the river valley is romantic-pure. Endless winding river, sloping rows of sun-tanning grapes, half-timbered towns dotting both shores, and heavy freighters struggling to negotiate the tight cliff turns. Since I have lived here, there have been at least four freighters who have either capsized or run aground at this point. I say, somebody give that woman a haircut! The winemakers: Some of the steepest vineyards are found here, producing some of the best wines. Quaint wine bistros and wine bars, produce simple yet exceptional, traditional yet award-winning, family-run quality. Die Winzerfamilien: Nur wegen der besonderen Qualitaet werden auch steilste Lagen bewirtschaftet. 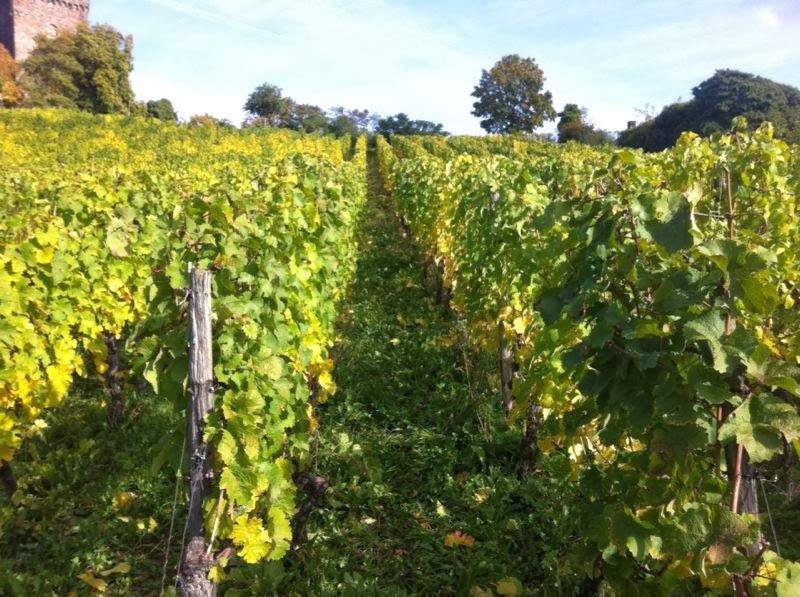 Verkostet wird in familieren malerischen Weinstuben voll von Tradition - die Muehe, die Arbeit schmeckt mann im Wein. Most of the stories throughout this region lead back to wine. The steep, terraced hillsides on both sides of the Rhine, create an incubator-effect for sun-loving grapes. Hard-working families have been working vineyards and making some of the country's most respected vintages for centuries, and before that, the monks were doing it. Even Sooneck Castle was transformed into a thriving vineyard for a time in 1770, when four residents of nearby Trechtingshausen used the grounds to plant vines and make wine. I'm sure that year's wine was fit for royalty. 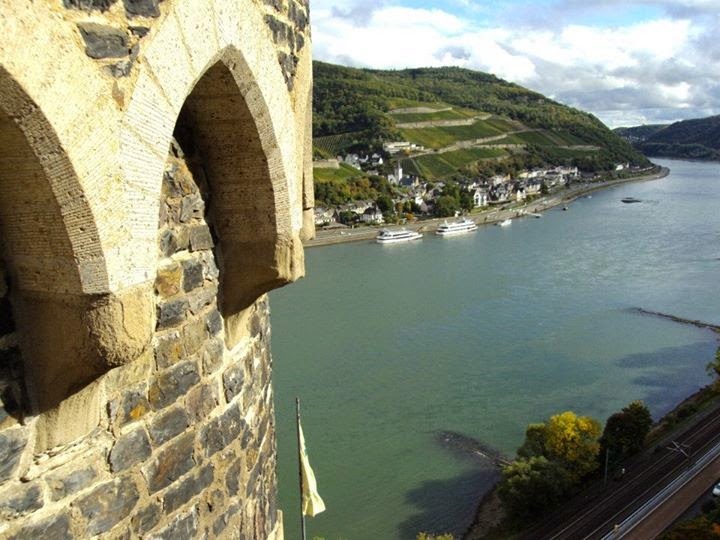 If I was a castle blogger, I would explore all of the stories that the people, the places, and the castles of the Middle Rhine Valley have to offer. Through my lens, you will feel the cold, damp castle wall that I touch, you will meet the weathered vintner who lets me taste his youngest bouquet, and you will hear the steady hum of a freighter who fights the rushing current. The past and the present; people and place. Because the Rhine still flows. The castles still stand. The stories are still here. I will show you. Der Rhein fliesst noch. Die Burgen stehen noch. Die Geschichten leben noch. Ich werde es Ihnen zeigen. Herewith, please accept my application for the #burgenblogger position! I look forward to working for all of you...from a castle on the Rhine. Hiermit, bitte ich Ihnen meinen #burgenblogger Bewerbung anzunehmen. Ich freue mich auf der Gelegenheit durch meine Kameralens und Schrift den Mittelrheintaler Geschichten Ihnen anzulocken. 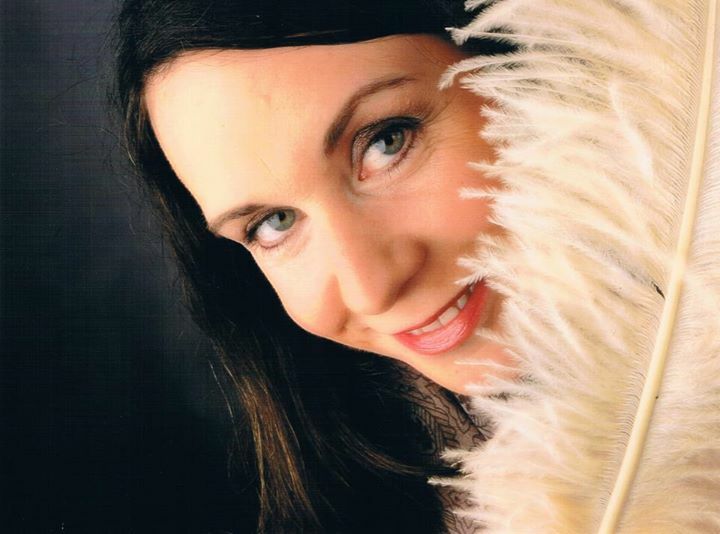 hop along with me...recipes, photos and order!